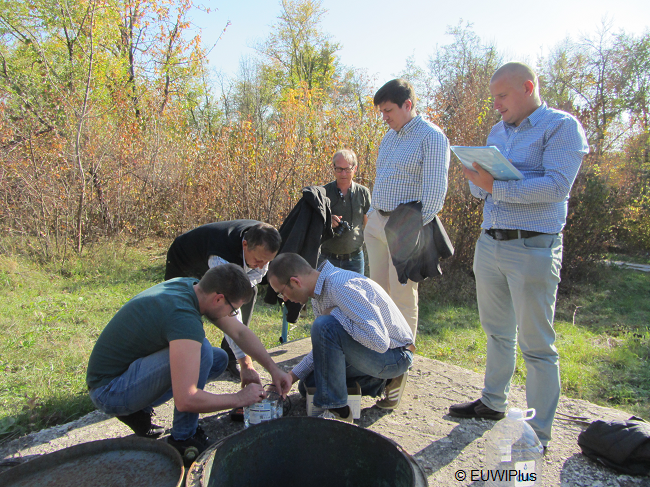 In the framework of the EU funded project European Union Water Initiative Plus for the Eastern Partnership (EUWI + 4 EaP) the Umweltbundesamt GmbH / Environmental Agency of Austria has organized a groundwater sampling training for Moldovan groundwater experts. The target audience was personnel, which is responsible for carrying out groundwater sampling within national groundwater monitoring activities. The training aimed at improving quality assurance and quality control in groundwater sampling and covered aspects of: planning sampling campaigns, field work and measurements according to international standards, treatment of samples, logistics with the laboratory and possible mistakes and their implications on the analytical results. The theoretical training was accompanied by a practical training with the own equipment of the SE “Hydrogeology Expedition of Moldova“, which is responsible for the groundwater survey in the Danube-Prut and Black Sea River District. The theoretical part of the groundwater sampling training was held at the premises of the Agency of Geology and Mineral Resources in Chisinau on the 16th of October 2018. The practical training was implemented at a monitoring well near the city of Ialoveni which is southwest of Chisinau.